It's National S'mores Day! I can’t remember where I was at the time, but a few years ago I went to a coffee shop that offered a s’mores latte. This drink was inspired by classic campfire s’mores, with their layers of crisp graham crackers, toasted marshmallows and melting chocolate. Unfortunately, the coffee shop in question used a s’mores flavored syrup and it didn’t quite live up to my expectations in the flavor department. I still thought it was a good idea, however, and decided to play around with the concept at home. 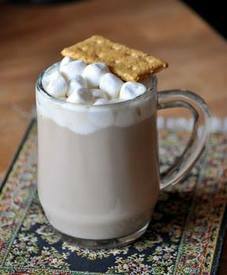 Adding the chocolate to hot coffee and milk was easy, and marshmallows on top added plenty of marshmallowy sweetness. I used milk chocolate, as that is the quintessential s’mores chocolate (although you can use dark if you prefer).